At this point, you've implemented the create order form and the reusable forms: CustomerDetails, OrderDetails and ProductOrders. 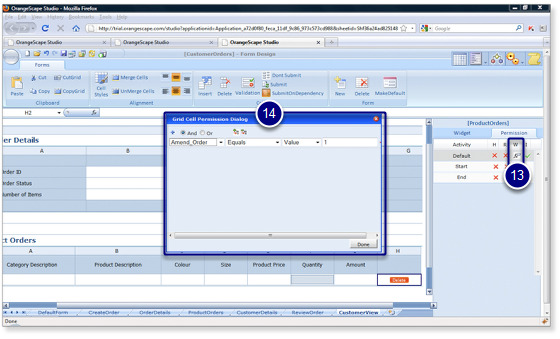 In this section, we will implement the customer view form. 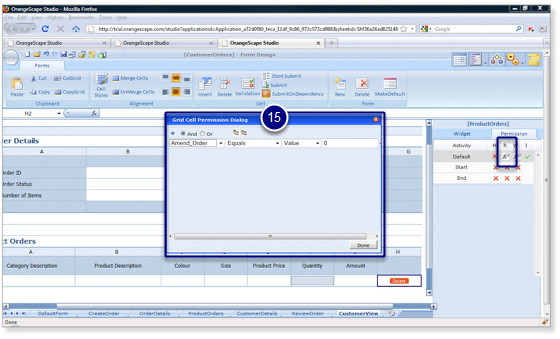 Customer view form can be accessed only by the customers using their registered mail id. Customers can either confirm or cancel their order using the "Confirm Order" button and "Cancel Order" button respectively. In addition, they can also amend the quantity for each product order after clicking on the "Amend Order" button. 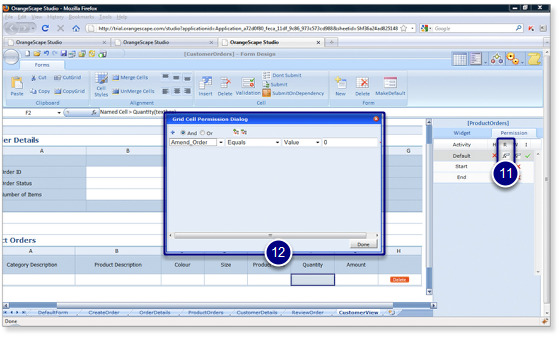 Permissions must be configured to control the read and write attributes for "Quantity" input field and "Amend Order" button. Note: Permissions for "Amend Order" button can be configured only after the button is added to the form. Buttons can be added only after completing the process design and action design. Create a new "CustomerView" form. Click on the forms widget. 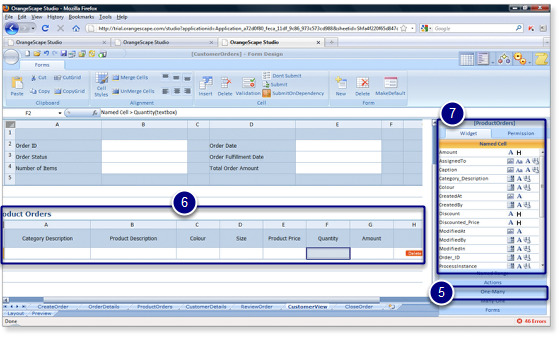 List of forms designed for "CustomerOrders" data model is displayed. Click on the form icon for "OrderDetails" in the forms widget. 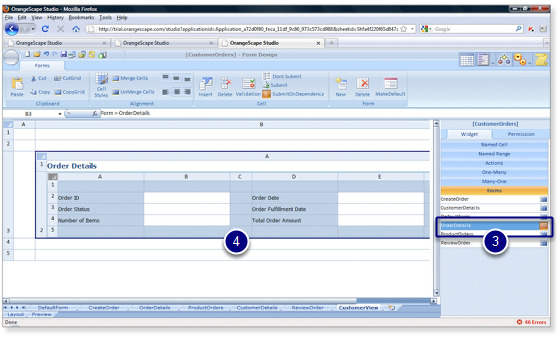 The orderdetails form will be inserted in the selected cell. 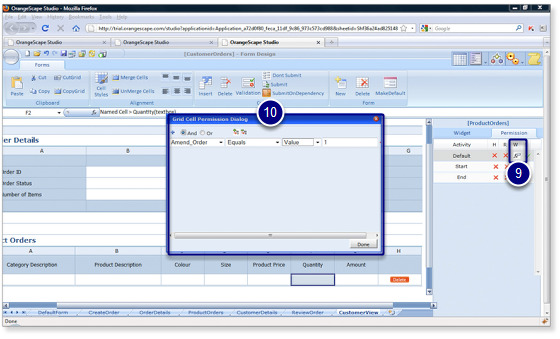 Insert a delete button for the product orders detail row using the actions widget. 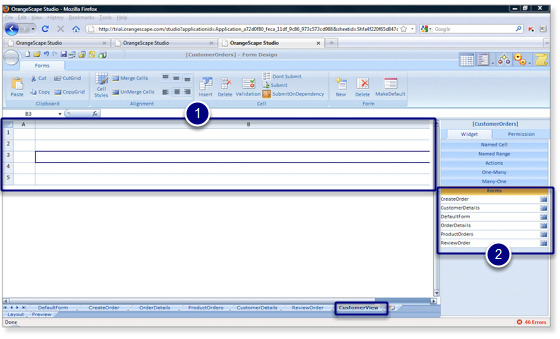 Replace the default input form fields with label fields for all the fields except quantity using the name cell widget. "fx" formula button will now be displayed for "Write". Click on the "fx" formula button for write. Add the condition to check if "Amend_Order" equals "1". Click on the "X" mark below "Read" to enable permissions for the default activity. 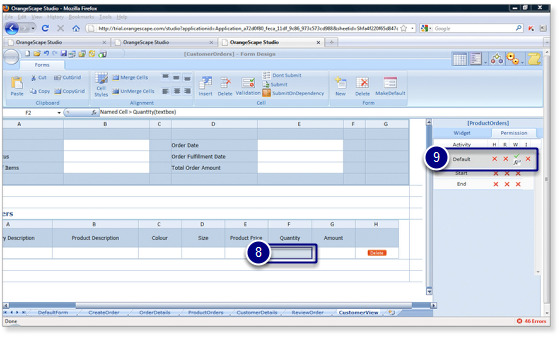 Click on the "fx" formula button for "Read"
Add the condition to check if "Amend_Order" equals "0". Click on the "Done" button to configure the permissions. Select the delete button and click on the permissions tab.